Bones City Challenge: Best Recap Video (Ever)! Dit bericht werd geplaatst in Bones en getagged met bones city challenge, bones wheels op 27 juni 2018 door admin. It’s almost time for the annual #bonescitychallenge! On Go Skateboarding Day, June 21, teams from 9 different cities will do several challenges and post the footy on Instagram. Lots of fun celebrating skateboarding with the homies is what its all about! To have a chance at winning cool Bones prizes, be sure to enter now at one of the following shops! 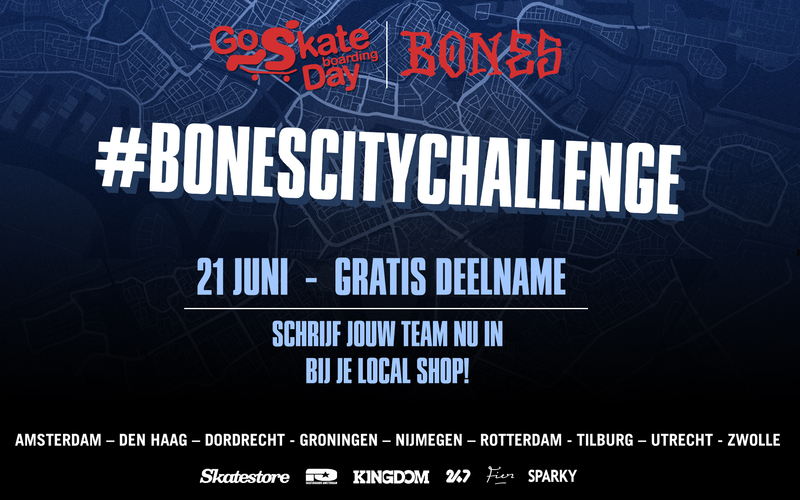 Dit bericht werd geplaatst in Bones en getagged met Bones, bones city challenge, go skateboarding day op 11 juni 2018 door admin.